Bundaberg Port Marina, docks at sunset. Queensland, Australia. 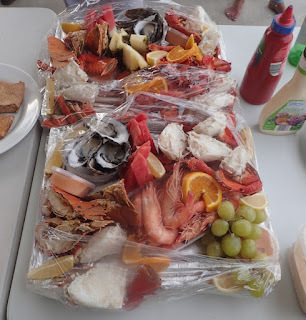 potluck, Bundaberg Port Marina. Queensland, Australia. “Bundaberg: Closest Australia check-in from New Caledonia,” was the Down Under Rally hook. Technically, that’s true. In the grand scheme, though, when you’ve at least 700 miles to sail, when the commitment’s made early enough, the difference of one (to Bundaberg, or “Bundy” as the locals call it) diagonal or another (to BrisVegas – errr – Brisbane) on the same coastline isn’t all that big. Nonetheless, if we chose Brisbane to enter Australia, we would miss out on Unesco World Heritage site Fraser Island, which is South of Bundaberg. Plus, many of our friends who chose to come to Bundaberg with the Down Under Rally, and after a week and a half’s passage with no one but just us two , we kinda wanted to catch up with friends. The antics of this crazy-eyed yellow throated miner amused us at our Bundaberg Botanic Gardens picnic lunch spot under the gazebo. Queensland, Australia. As we arrived at the tail-end of the rally events, most of the folks we knew had already spent a week here and we figured they’d be on their way out pretty quickly, Southbound, like us. Our plan was to check-in, catch up on friends and set-up phone and wifi, provision, do laundry, refill our water and fuel and get out. Generally, we can accomplish all that in 3 days or less. Check-in ate our first half-day, but that’s pretty quick compared to a number of countries which entailed up to 3 days to complete. Figuring out that our unlocked Alcatel Android phone was incompatible with Australia's phone network when using the phone as a cellular data hotspot took that long to figure out. Our cheapest solution was to buy the least expensive locked Telstra Android mobile phone, $69 AUS. 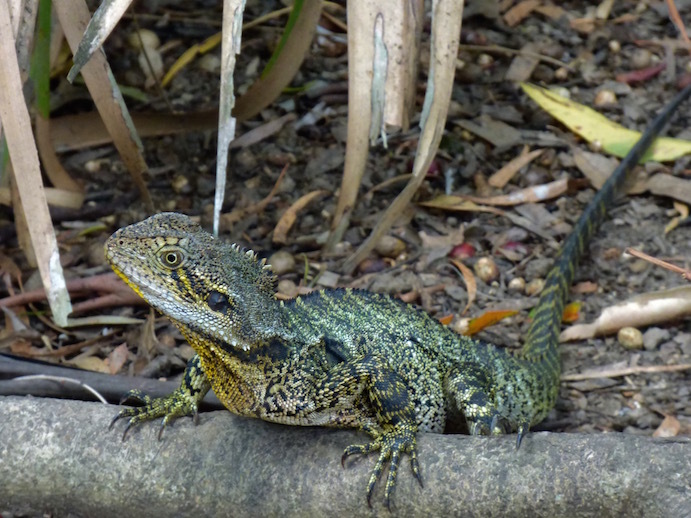 Eastern Water Dragon, Bundaberg’s Botanic Gardens. The Southwesterlies, however, had other ideas with its in-your-face gusts effectively foiling speedy South-bound plans. While we fretted about spending 6 days in Bundy, most of the folks we knew found themselves there for 2-3 weeks or more. As expected, they’d planned on sailing South the day after the rally activities finished, and were really chomping at the bit. Most remained docked at the Bundaberg Port Marina, or anchored just outside at the mouth of the Burnett River. 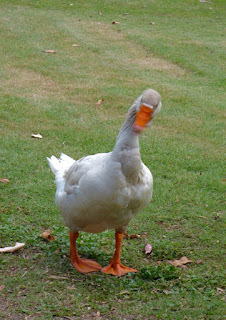 Funny duck at Bundaberg’s Botanic Gardens. Certainly, Bundaberg Port Marina’s an accommodating spot. Clean, nice shower and laundry facilities, restaurant, wifi, take-away and bar on site, fuel and water. The local IGA grocer offered cruisers rides to and from their store (we walked there, rode back with a huge load of groceries) and there’s a free van to town in the morning, and the local bus for the return trip, though 3:30 pm for the last one is too early in my books. For a relatively paltry $49 AUD you can rent a car for the day, though we didn't. Did I mention Bundaberg Port Marina’s showers – emphatically enough? When Wayne asked “How was your shower?” knowing that I bypassed our more convenient hot shower aboard for the marina’s showers for a much needed good long hair wash. “Orgasmic!” I replied, with a blissfully contented sigh and the cleanest hair and scalp I’ve had since the marina showers in Whangarei New Zealand, where I had to feed “gold coins” for those nice but timed showers. It’s amazing how easily it is to satisfy a cruiser who’s spent so much time at sea and in second and third world countries with a clean, working shower with good water pressure and drainage that requires no coins to operate and no button to push every few seconds to flow. Cattle Egret at Bundaberg Botanic Gardens. 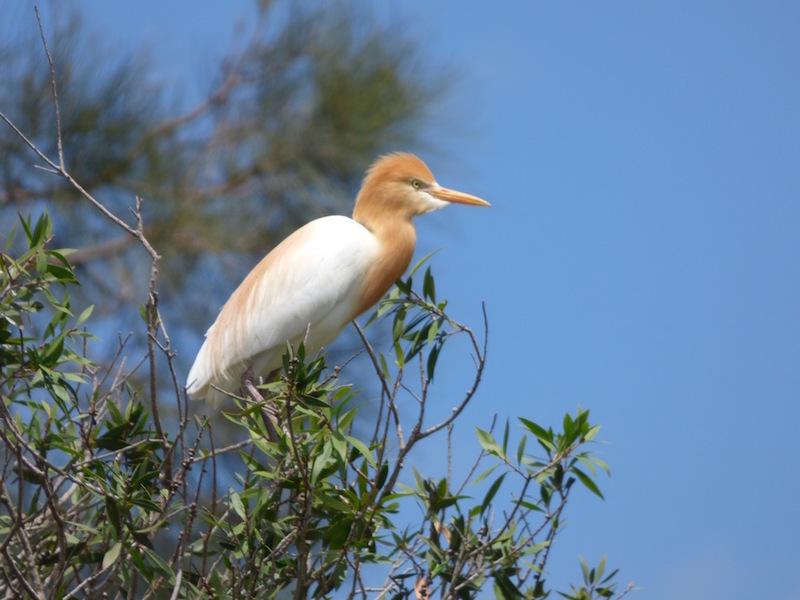 Its plumage turns rust-toned only during mating season. We spent two nights at Bundaberg Port Marina. On our first night enjoyed a lovely Ocean Cruising Club hosted / potluck dinner, located in a nice covered picnic area. However, “Flies of biblical proportions,” as Ann of Sofia described them were a nuisance. Apparently they floated in with the Southwesterlies en masse. They didn’t bite, but they incessantly buzzed ears and eyes and settled in hordes on our backs as if it was a concert mosh pit. Ok, I’m exaggerating… a little. Curious emu at Bundaberg’s Alexander Park Zoo. Rather than scrambling to get out biz – and fun, for that matter, if we were “stuck” for a while -- done in time in time for the bus back, we decided to just sail closer to town. The relatively shallow Burnett River meanders eight miles to town, with the option to anchor for free* right off downtown, then just dinghy up to shore at the public dock. And the flies didn’t seem to make it to Bundy-town. Our sailboat has a pretty shallow draft, 4 ½ feet, shallow enough to not get grounded. So downtown we went, planning our trip to take best advantage of the tidal flow. We anchored just short of the bridge, as it was lower than our mast is tall. 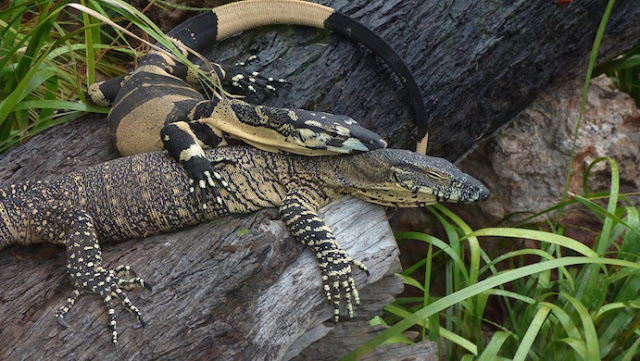 These two goannas made a cute couple at Bundaberg’s Alexander Park Zoo. Queensland, Australia. Proximity to downtown made it much easier for us to get our phone and wifi set up as we were just a hop and a skip to the Telstra store. We also topped off our groceries and libations. Within less than an hour, given we were still waiting for favorable winds, we had time to play! 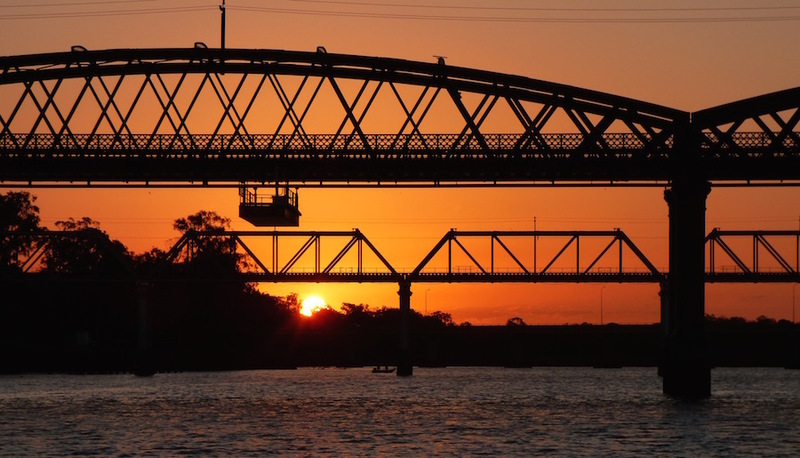 Bridges of Burnett River, Bundaberg, Queensland, Australia. We checked out the Bundaberg Botanic Gardens (so-so gardens but great place to check out birds and aquatic life) and Fairymead Home / SugarCane Museum (a good place to learn Australia ranks third in the world in export of raw sugar). Fairymead home was moved to the gardens from another location in 5 large pieces via flatbed truck! Its hours are limited, so check ahead and plan accordingly. The park also houses an aviation museum dedicated to famed local pilot, Bert Hinkler*, Bundaberg Railway Museum and the Bundaberg District & Historical Museum we passed on, as time was short and we didn’t want to get museum-ed out. We also dropped by the tiny and free zoo in Alexander Park. Parched, we then partook in an incredibly affordable drink ($7 Australian total for 1 beer and 1 wine) overlooking the river at the RSL – Returned Service League (as Wayne is a USA veteran with 20+ years duty). 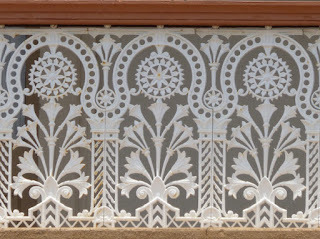 architectural details that enchanted us in Bundaberg. *Hinkler’s best known aviation achievements were his solo flight from England to Australia in 1928 and the world’s first solo flight across the South Atlantic in 1931. 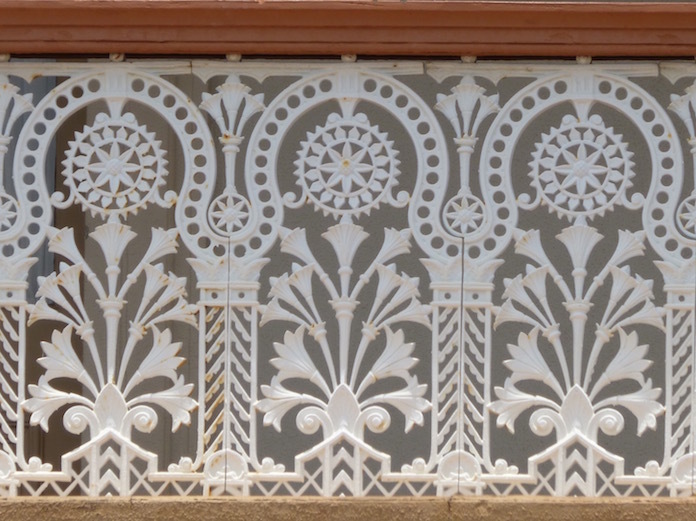 Largely settled around the late 1800s, we found Bundaberg’s well-preserved architecture charming. The sunset just West of the Bundaberg bridge was picture perfect. In the morning, we awoke to a birdsong concerto, then the red-throated welcome swallows partied on our lifelines and rigging, as many as 40 at a time. 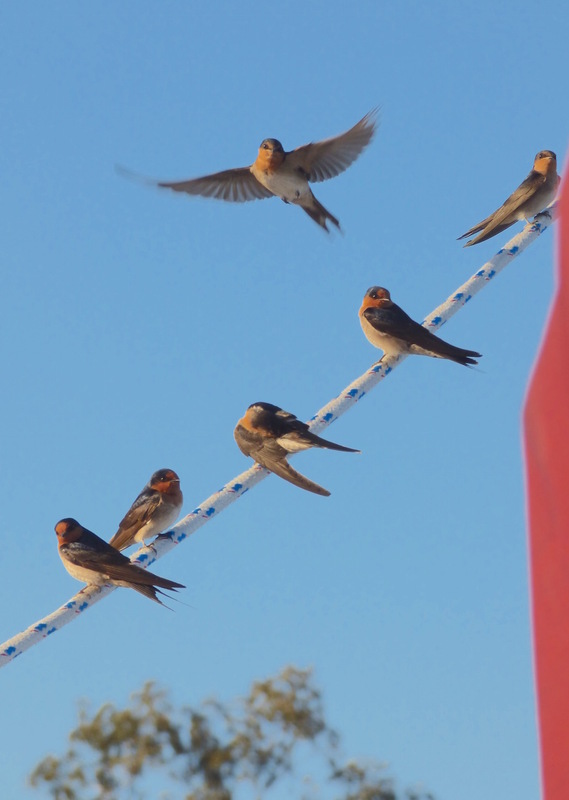 We counted as many as 40 welcome swallows on our boat at a time. Burnett River, Bundaberg, Queensland, Australia. Pleasant as the Bundaberg Port Marina is, I wondered aloud why anyone would spend 3 weeks there, when they could anchor downtown, with much more to do, for free. Bundaberg Port Marina was $48/night AUD for 36.5’ boat. “But it’s kind of like a world cruiser sailing to the USA and ending up in St. Helens on the Columbia” mused Wayne. “It’s just not what non-local people do!” Then again, when we lived in the Portland Oregon area, summertime we loved taking our small motor boat to the tiny riverfront town of St. Helens, a little past our favorite beach on the river, Sauvie Island. St. Helens has a nice free public dock, clean bathrooms with showers, a vintage movie theater, and free concerts on Thursday nights. Most folks in Portland don’t even know St. Helens exists. Our last day downtown, Heather drove to Bundy from her home in the sort-of-nearby Hervey Bay area to welcome us. As Hervey Bay is heavily populated by pensioners, they call it [with typical dry Ozzie wit], “God’s waiting room,” she told us. A former wanna-be Pearson sailboat owner, Heather got to know us a bit from my blog links on the Pearson 365 forum. Heather’s boat owning days are done, but as a volunteer she sails the tall ship South Passage. Thanks to Heather playing tour guide, we were able to take in the view of the Bundy area from The Hummock Lookout, check out the popular Bagara coastal area. Finally, no trip to Bundaberg would be considered complete without at least checking out the store* at the famed Bundaberg Rum Distillery. Heather also left us with the Maritime Safety Queensland’s Beacon to Beacon Directory, which we’re putting to good use right now. 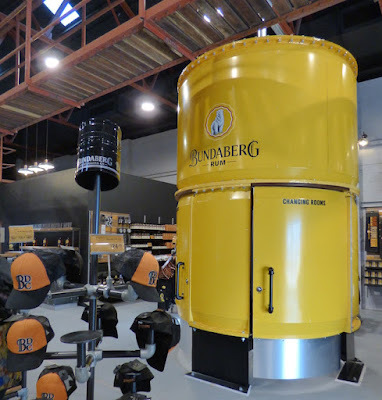 *$30 AUD each for the Bundaberg Rum Distillery tour was far too dear for our tight cruising budget, especially as we’ve toured several rum distilleries elsewhere for free or paltry fee. Besides, we're not that keen on Bundy Rum, though there's still a Dark & Stormy (classic Bundaberg rum and ginger beer) in my future. 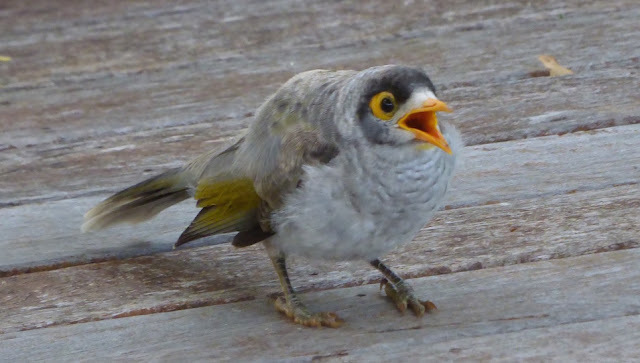 We suspect we saw more of Bundaberg in 6 days than our marina-bound friends did in 3 weeks. It’s a pleasant spot, with friendly locals and an easy place to spend time without spending much money. There’s always more to see, yet we feel we paid our respects reasonably well to this lovely little Queensland town and are grateful for the experience. 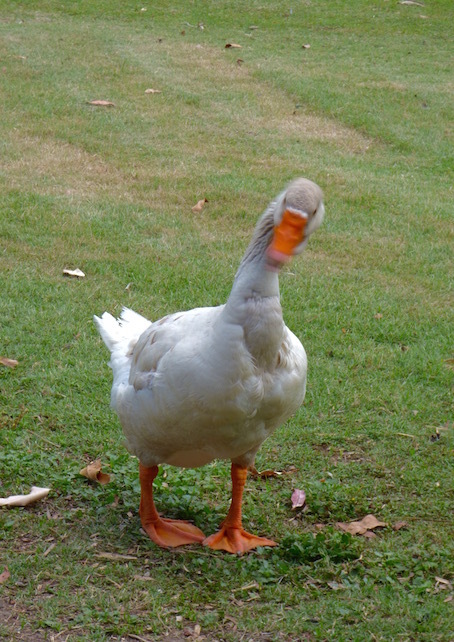 Now we’re itching to head South, and see more of the great land of Oz. This is a recent retrospective of our time at Bundaberg Port Marina (S24.45.618 E152.23.794) November 14-16, 2016, and Bundytown anchorage (S24.51.796 E152.20.892) November 16-18, 2016. We also anchored at the Burnett River mouth (S24.45.411 E152.23.704) the night before we arrived at Bundaberg Port Marina and the night after Bundytown (S24.45.405 E152.23.728) as we staged our hop to Fraser Island. 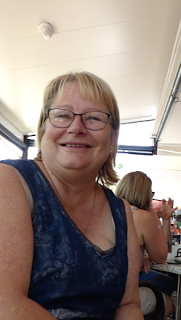 By the time you read this, we’ll be underway on an overnight passage from the Fraser Island area (watch for at least one more post on Fraser Island as well as still some catch-up posts on New Caledonia) to Scarborough Marina, a suburb of Brisbane, just a tad under 100 mile sail. The Hummock Lookout offered an excellent territorial view of the cane growing region surrounding Bundaberg.